In early January 2014, a TPR editorial called for a more level-headed debate on independence/autonomy for Tibet. That editorial called for the debate to be de-mystified, and instead treated like any other policy discussion whose facts, assumptions, and arguments should be clearly laid out by both sides. 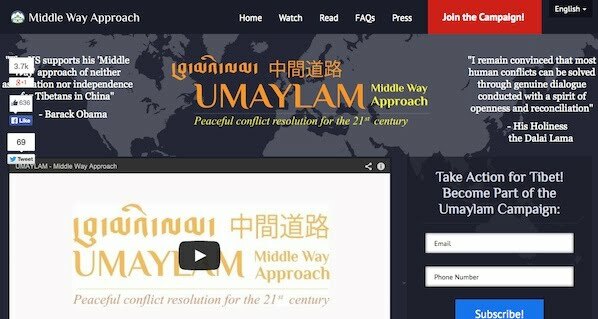 On June 5, 2014, the Central Tibetan Administration (CTA) leadership took a major step toward this goal, launching a new public campaign to promote its “Middle Way Approach”. This MWA Campaign should be applauded, especially as it advances exactly the type of level-headed discussion needed over Tibet’s future. This is not the first time the CTA has launched such a campaign, but it is different in form and content. With form, it uses modern multimedia technology. With content, this is the first campaign to promote the current administration’s re-interpretation of the Middle Way, which differs from the Middle Way of His Holiness the Dalai Lama in several important ways (as discussed below). In August 2005, then-Kalon Tripa Samdhong Rinpoche launched what the CTA called “a massive public awareness campaign on the Middle-Way Approach of His Holiness the Dalai Lama”. This campaign used traditional media: a documentary film, Q&A sessions in the Tibetan refugee settlements, and print materials. This new MWA Campaign, by contrast, uses modern tools of the 21st century: it has a well-designed website, a YouTube video, and downloadable PDFs in multiple languages. It also uses social media like Facebook to spread the message far more widely than the 2005 campaign could have hoped for. It was kicked off with a press conference that gained media attention in major outlets around the world. These are all signs that the CTA is modernizing its approach to messaging and publicizing the Tibetan struggle, and should make all Tibetans feel proud. Significant credit surely goes to the Sikyong, Lobsang Sangay, and the minister of Information and International Relations, Dickyi Chhoyang, as well as the CTA employees who worked on the multimedia materials. The MWA Campaign website sets out a list of achievements attributed to the Middle Way, lists of supporters, and also a briefing note and FAQ. Essentially, the CTA is laying out in one place all its arguments as to why its policy is the best one for the future of Tibet. This is exactly the sort of level-headed advocacy that TPR hoped for back in January 2014, and it now falls to independence supporters to step up and do the same to advocate their views. 1) The Timeline says that His Holiness and the CTA made an “internal decision” in favor of the Middle Way back in 1974; the reality is more complicated, and the policy did not fall into place until later. In His Holiness’s March 10 address in 1977, he still spoke of “our struggle for the independence of Tibet.” Even as late as 1986 (a year before the Five Point Peace Plan, which was the public start of the Middle Way), His Holiness declared in his March 10 address that “Tibetans do not want to live under alien occupation.” By incorrectly portraying the Middle Way as having been firmly in place back in 1974, the Timeline overstates the link to the 1979-1985 fact finding delegations (which are incorrectly listed as major achievements of the Middle Way). 2) The Timeline calls the 1987 pro-independence demonstrations a “street protest”, with no indication of what the demonstrators were calling for. 3) The Timeline repeats the misleading insistence on portraying the self-immolators as calling only for “freedom”, which is a troubling issue that has been discussed before. The main deficiency of the MWA Campaign content is, quite simply, that it does not accurately describe what the CTA leadership now means by the term “Middle Way”. It fails to show that the meaning of that term has been changed significantly from the vision once outlined by His Holiness. This is a problem, since the premise of the campaign is to advocate for a policy that the campaign does not accurately describe. Sikyong Sangay’s new interpretation of the Middle Way abandons the goal of democracy, allows China full discretion in militarization, and accepts Communist Party rule in Tibet in its “present structure” (for more detail see here and here ). At the Council on Foreign Relations (CFR), the Sikyong made it clear that his vision of the Middle Way does not call for real political reform, and would essentially be satisfied if Tibet were geographically unified and there were more ethnic Tibetans in the Communist leadership in Tibet. It must be emphasized what a major policy change this is. The CFR moderator, noted China legal scholar Jerry Cohen, seemed incredulous (“how do you maintain autonomy if you have continuing party control of the government”). Later at the National Endowment for Democracy, the Sikyong defended his policy by claiming that his re-interpretation of the Middle Way is no different than the policy laid out by His Holiness or in the last administration’s Memorandum and Note. This is demonstrably inaccurate. His Holiness has called for Tibet to be a democratic and demilitarized self-governing entity. The Memorandum calls for “the right of Tibetans to create their own regional government and government institutions and processes.” Even this month, His Holiness called on China to “enter the mainstream of global democracy” in His statement on the 25th Anniversary of the Tiananmen Massacre (the Sikyong made no statement on this occasion). His Holiness’s Middle Way can be thought of as a proposed compromise between occupation and independence. The idea is, by is very nature, relative; it depends on independence as one of the two end points to be in the “middle” of. Sikyong Sangay’s policy is, by contrast, a proposed compromise between occupation and the Middle Way. By moving the end-points, it has become the Partial-Middle Way. During His Holiness’s eight-sentence long remarks upon being presented with materials for the MWA Campaign following His teachings at Tibetan Children’s Village, His Holiness referred all questions about it to the Sikyong. Clearly, this means the Partial-Middle Way belongs to the Sikyong. The CTA leadership must therefore be clearer with its audience about exactly what is (and is not) encompassed in the Partial-Middle Way. • What would a future Tibet look like without democracy, and without restrictions on militarization or Communist party control? How is this genuine autonomy? • Why should Tibetans support the Partial-Middle Way vision, over other choices including independence or His Holiness’s original Middle Way vision of a democratic and demilitarized Tibet with its own government institutions? • When Chinese democrats like Liu Xiaobo express support for Tibetan autonomy, are they referring to His Holiness’s democracy-based Middle Way, or the communist rule envisioned under the Sikyong’s Partial-Middle Way? By honestly addressing the differences between the original Middle Way and the new Partial-Middle Way, the MWA Campaign can become more effective in laying out the arguments for where the CTA leadership wants to take the future of Tibet.